ACTUAL BRIGHT LIGHT - 6 Watts - Up to 600 Lumens of bright light. 4500K is a natural white color ensuring clear lighting without being harsh. Lights up your garden, driveway, patio, entrance, street or anywhere you need light after dark. CHOICE OF INSTALLATION & EASY INSTALLATION- Easily install the light anywhere in minutes, no need to hire an electrician. Mounting hardware included. Direct mount onto wall or pole. LONG LIFE BATTERY & BETTER SOLAR PANEL - Premium 4500mah 6.4Volt battery has the power to stay on longer and run for years and years. 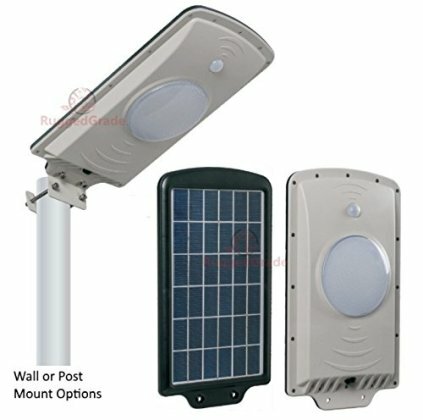 The solar panel is a premium 9 Volt and 7 Watt Polycrystalline panel. Ensuring a full charge in about 8 hours.